At lot of people play Miles Davis songs because they are immediately identifiable and they possess a timelessness and durability that few others offer. On the Kind of Blue classic “So What” we have Gress starting out with the bass line made so famous by Paul Chambers. The tempo is a bit quicker paced than the original and of course there are no horns on this version but the lineage is unmistakable. 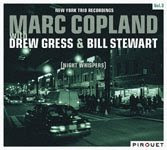 Gress takes the first solo and explores the song’s essence with an energized pizzicato that prances along nicely to the rhythmic cymbals of Stewart and the comping chords of Copland. When Copland starts his solo the temperature is raised a notch, as he intensifies the proceedings with a reckless abandon approach that seems to be climbing, elevating us to some point unknown. His eruptive breaks are exquisitely timed and he is never without some thoughtful refrain at the precise right moment. Here his introspective qualities are tamed as he lets himself be swept away by the force of this familiar modal piece. Stewart is given his opportunity to make a statement and drives his point home forcefully with a combination of snare rolls, pounding toms and crashing cymbals in a slashing display of energy and inventiveness that has a most aggressive feel to it-in stark contrast to Jimmy Cobb’s more subtle treatment in the original. In the final refrain Gress, Stewart and Copland produce a bell-like clanging drone that slowly fades into oblivion. Miles would approve. Labels: "So What", Bill Stewart, Drew Gress, Marc Copland. jazz piano trios, Miles Davis Covers, Review of Marc Copland Trio's "So What"
Bobby Selvaggio's Modern Times Review of : "Quick Solutions"
Musicians: Bobby Selvaggio ( alto saxophone); Kenny Werner (piano); Sean Jones (trumpet); Matt Widton (bass); Nathan Douds (drums). 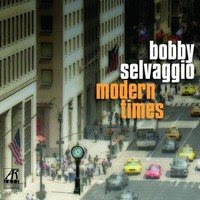 On his new CD “Modern Times” saxophonist Bobby Selvaggio demonstrates that good jazz is alive and well in his hometown of Cleveland. With a powerful alto sound that at times reminds me of Jackie McClean, he caught my attention immediately. He offers Julian “ Cannonball” Adderley as his principle influence. Other reviewer’s have heard Phil Woods in the thirty year old’s driving alto sound. Comparisons aside, the sound he produces is all his own- grounded in the tradition. He has that special something that makes you want to hear more. Joined by the particularly adept playing of Sean Jones on trumpet the two go through the paces like McLean and Shaw once did before them. On “Quick Solutions” Jones and Selvaggio play the serpentine start stop changes in exceptionally synchronized unison before the altoist takes off into classic flight mode. Selvaggio is clearly not on autopilot here where he soars with taught expressiveness as his solid rhythm section maintains the quick pace.When it is his turn Jones takes an equally facile and searing solo. Selvaggio offers tightly woven compositions with exceptionally well-executed precision, adept changes in time and a smoldering passion in his playing that is mature beyond his years.